The journey began by working with Amaru the powerful snake of the lower world. It continued with Chocachinchi the commanding jaguar of the middle world and Apucheen the great condor of the upper world The Q'ero shamans connect to these beings with chakra-like centers in the Belly, Heart, and Mind. The Inca shamans have the task of healing their communities and preserving the energy pathways of Pachamama (Mother Earth). They are reaching out to others, including Deborah Bryon, because their spirit journeys have told them that the next set of shamans will come from the modern civilizations of the Western world. Four years of training, from 2005 to 2009, are included in this book. The book contains Dr. Bryon's personal journey. Her struggles to live in both the ordinary reality of a day job and the non-ordinary reality of a quest for shamanic understanding are described with clarity, insight, and appropriate amounts of humor. Along with her story, she analyzes her quest in the context of Jungian theory and, at the same time, explains how her journey includes aspects beyond the usual boundaries of Jungian thought. is a licensed psychologist and diplomate Jungian analyst in private practice in Denver, Colorado. She completed a BA in psychology at UCLA, a BFA in drawing at Metropolitan State College of Denver, and a PhD in Counseling Psychology at the University of Denver. Deborah obtained her analytic training with the Inter-Regional Society of Jungian Analysts and is a psychoanalyst through the National Association for the Advancement of Psychoanalysis. Since 2005, Deborah has received in-depth training with Q'ero shamans in Peru and has undergone a series of sacred initiations with the shamans she has worked with. Deborah is writing, teaching classes, and leading groups combining Jungian depth psychology, psychoanalysis, and shamanism. She is the author of several articles on shamanism and psychoanalysis. Deborah spends her free time gardening, traveling, and is an artist and member of Spark Gallery. She has taught in the psychology departments of the University of Colorado and Metropolitan State College of Denver. Deborah has two adult sons, Devin and Colin. She lives with her husband Perry, two dogs, cat, and a macaw. Deborah Byron did an amazing job of weaving together teachings from both the Inca and modern day psychology. Tales of her adventures combined with telling stories from her wealth of knowledge of psychology provide marvelous insights. Lessons of the Inca Shamans is a brilliant work which shares deep and rich stories and powerful practices. I loved reading it. This book really opens up the secret world of the Inca shamans to people who are unfamiliar with the Incan world. The descriptions are vivid and exciting. The text is very seductive and brings you into a whole new way of seeing the world. It's a great read! From time immemorial, shamans of many cultures have been able to lift the veil between ordinary and paranormal reality. 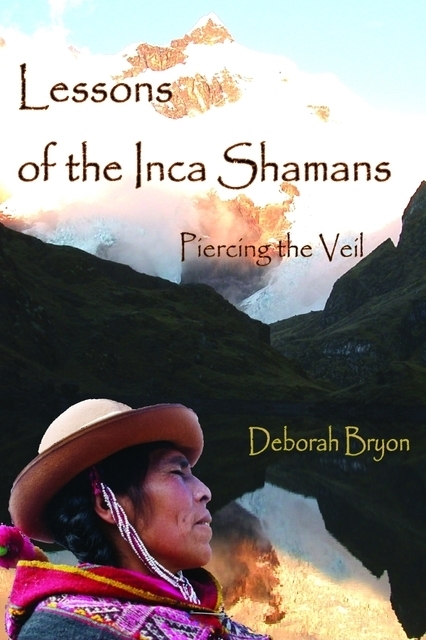 In this fascinating book, Dr. Bryon describes how she learned from Peruvian Shamans how to consciously pass through that veil in her own life. Much like Legolas in The Lord of the Rings, she learned to live in both that shamanic world and the world of a Jungian analyst. Readers who want to lift the veil in their own lives can learn much from her story. Deborah Bryon's work is not only an introduction to Peruvian shamanism, nor simply an effort to comprehend shamanism in psychological terms. It is at the same time a personal account of the most difficult part of depth work -- the struggle to integrate what one has experienced in the deeper inner realms into one's ordinary life. Deborah's writing reveals, in sometimes stark fashion, this struggle and so makes the book worthwhile not only for those interested in shamanism but for anyone who turns within and who must then return to the world. She couples experience with theory to create a model that is helpful to anyone engaged in self-exploration. In Lessons of the Inca Shamans, the reality of the shamanic world comes alive. Deborah Bryon finely weaves these energies into a Jungian-informed psychotherapy, but also goes beyond the world of image and symbol into what she calls the energetic collective. I highly recommend this book.